Summary: It's 1854 and sixteen-year-old Molly would give anything to change her circumstances as a lowly servant in a posh London house. So when she hears of an opportunity to join the nurses who will be traveling with Florence Nightingale to the Crimea, she jumps at the chance. The work is grueling, the hospital conditions deplorable, and Miss Nightingale a demanding teacher. Before long, the plight of British soldiers becomes more than just a mission of mercy as Molly finds that she's falling in love with both a dashing young doctor and a soldier who has joined the army to be near her. But with the battle raging ever nearer, can Molly keep the two men she cares for from harm? A love story to savor, and a fascinating behind-the-scenes imagining of the woman who became known as "the lady with the lamp." I love Suzanne Dunlap's books and I'm SO excited for this one! I loved this book and would be delighted to have a finished copy. And it's signed! It sounds great - thanks! 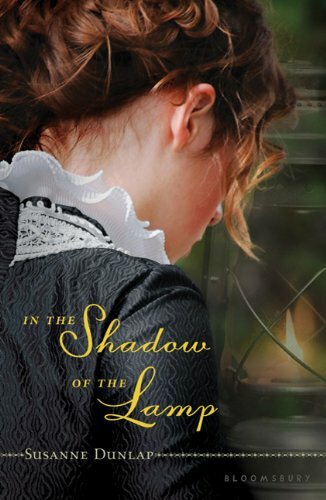 I've read so many great things about In The Shadow of the Lamp! I would like to be entered please. Thank you! Looks like a good historical...my favorite genre. Thanks for the chance! Thanks for hosting these great giveaways! I love YA historical fiction. This is on my wish list!! Thanks for the giveaway! omg i want to read this book so badly, you have no idea! Yayyy I am awake and looks like I'll have a lot of contest to get a hold of! Oh my gosh, the last book I read of hers was amazing and this one sounds just as good. Oh, I would totally love to win this one! Historical fiction about the Crimea-so excited! This one sounds great. Please enter me. I'm crazy about historical fiction and I'd love to be entered for this! Thank you! I've been wanting this one! Thanks for the giveaway! I'd love to read this book, please enter me. Thanks again for hosting! This is in my wishlist! I'd love to read it! This looks interesting. Thanks for the contest! Florence Nightingale has always been one of my heros so anything remotely connected to her attracts me. I'm so excited for this book. Please enter me. Lots of great historical fiction n the Craze. This sounds really good. Enter me please and thank you! Thank you for the giveaway and please count me in. I'd love to win this!!! :D I love History! Please enter me! Th book has been n my TBR list since I've heard about it. I love the cover!